January 4, 2016 (Jacumba)--The Jacumba Hikers and Walkers have announced their schedule of hikes for January and February in the high desert region surrounding Jacumba Hot Springs. The hikes range from easy to extreme, covering terrain from wilderness to a desert oasis, mountains and canyons. You’ll also see sites rich in history reflecting the region’s Native Americans, Spanish, and pioneer settlers. Other excursions including a trip to the Chinese Castle, a Garnet Mine, Goat Canyon’s railroad trestle, and a waterfall, plus dips in mineral hot springs at the Jacumba Spa and Resort. For a full schedule, scroll down, and also be sure to read these hikng safety tips. October 24, 2015 (Jacumba Hot Springs) – Fall is in the air and it’s a great time to take a hike. The Jacumba Hikers/Walkers have a series of hikes coming up to intriguing locations, with various levels of difficulties from easy to extreme. November’s destinations include Tule Canyon, Round Mountain, the Old Butterfield Stage Coach route, and Amadeo’s Straw bale cabin compound. 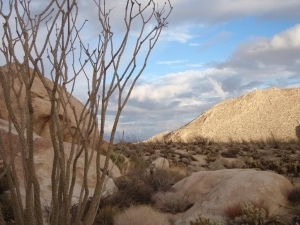 In December, the group will hit the trail for an ancient waterfall and Davies Valley, wind caves in Anza Borrego Desert State Park, an ancient juniper forest, and the Valley of the Moon. November 25, 2013 (San Diego) --Ticks might be tiny, but they can pack a punch when it comes to affecting your health. The County’s Health and Human Services Agency warns of an increased possibility of contracting a tick-borne disease. In 2012, HHSA received reports of San Diego County residents with confirmed or probable tick-borne illnesses. This included 14 cases of Lyme disease, two cases of Rocky Mountain spotted fever, two cases of other rickettsial diseases (which include spotted and typhus fever), and one case of ehrlichiosis, a bacterial disease affecting people and animals. Ticks can also carry tularemia and cause tick paralysis. March 8, 2011 (Rancho Jamul) – Rangers at the San Diego National Wildlife Refuge in Rancho Jamul invite you to join in an easy to moderate “”Discover Wildflowers” hike with a U.S. Fish & Wildlife service ranger, featuring native plant experts from RECON Environmental Inc. The hike will be held on Saturday, March 26 from 9-10:30 a.m.
July 18, 2010 (Ramona) – Cal-Fire rescued four dehydrated hikers and a dog, but were unable to save a second dog that collapsed and died on the trail to Cedar Falls near Ramona on Saturday. The group had hiked more than two miles in temperatures over 100 degrees. The tragedy illustrates the need for hikers to know safety tips for themselves--and their dogs.